Posted by lifealgo in Conferences. 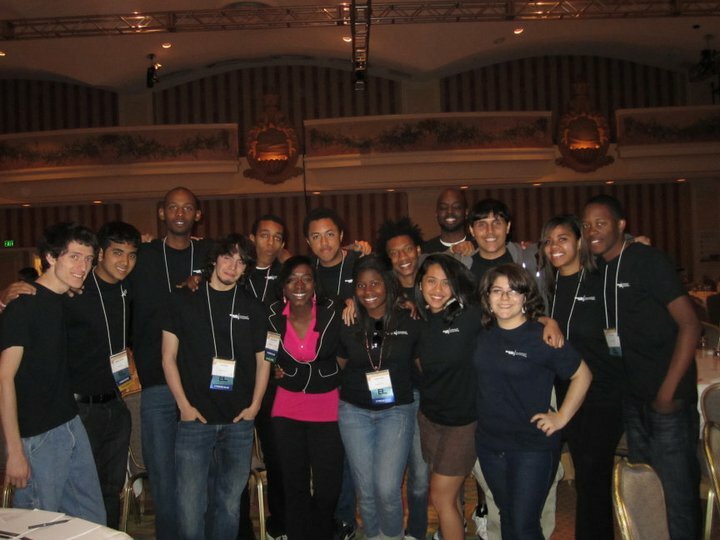 The 2011 Richard Tapia Conference for Minorities in Computing was pretty fantastic! This year the event took place in San Francisco, California. 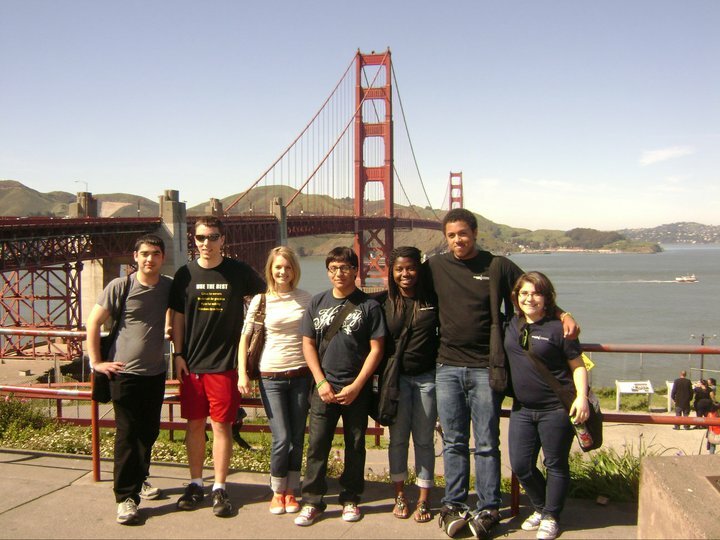 A group of about 20 students were sponsored by the CoC’s Office of Outreach, Enrollment, and Community, and we were really excited both about the conference and the city. I actually wrote a small blurb about the conference over at the CoC’s Student Community page. Always happy to report the student's POV! 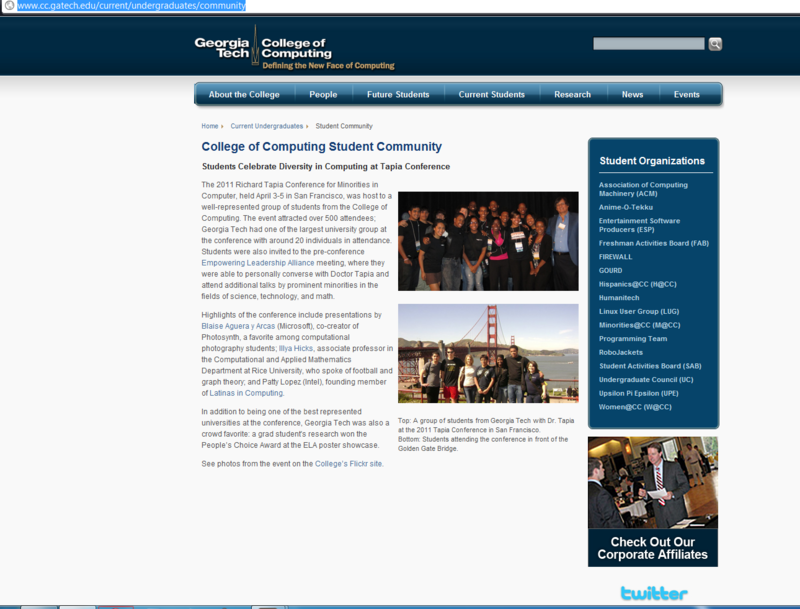 The 2011 Richard Tapia Conference for Minorities in Computer, held April 3-5 in San Francisco, was host to a well-represented group of students from the College of Computing. The event attracted over 500 attendees; Georgia Tech had one of the largest university group at the conference with around 20 individuals in attendance. Students were also invited to the pre-conference Empowering Leadership Alliance meeting, where they were able to personally converse with Doctor Tapia and attend additional talks by prominent minorities in the fields of science, technology, and math. Highlights of the conference include presentations byBlaise Aguera y Arcas (Microsoft), co-creator of Photosynth, a favorite among computational photography students; Illya Hicks, associate professor in the Computational and Applied Mathematics Department at Rice University, who spoke of football and graph theory; and Patty Lopez (Intel), founding member of Latinas in Computing. In addition to being one of the best represented universities at the conference, Georgia Tech was also a crowd favorite: a grad student’s research won the People’s Choice Award at the ELA poster showcase. See photos from the event on the College’s Flickr site. I was actually able to meet Dr. Tapia in person at the ELA event! The talks and presentations were all inspiring, thought-provoking, and, in some cases, humbling. They definitely sparked a lot of discussion among the group of students I traveled with, yet I can definitely say we all left with the same inspiration: no matter how underrepresented we are in the field of computing, this in no way undermines our ability to succeed. Tech friends and me with some new friends from the University of Illinois - Chicago!